The principle of self defense is both a natural right and something that is built into America’s laws, beginning with the Constitution.People who are minding their own business have a right to protect themselves … and if you interfere with that, there can be serious consequences. 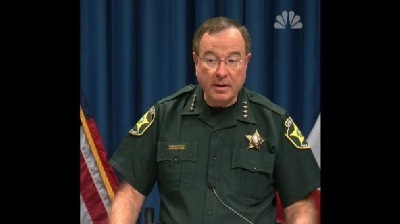 That was the basic message of Sheriff Grady Judd of the Polk County Sheriff’s Office, he delivered it in a no-nonsense manner that needs to be seen by every citizen.
.***Click here to see his comments***. Source details here: .https://www.westernjournal.com/ct/sheriff-unloads-hothead-criminals/ . 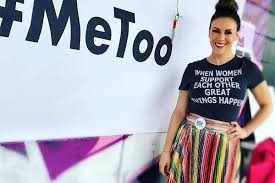 Gun control is something pushed by people who want to be protected by guns like "Actress Alyssa Milano who attended an anti-NRA protest in downtown Dallas, surrounded by armed guards. In video captured by Ben Howe, NRA member Will Haraway asked Milano’s security if he was armed and the man clearly wasn’t amused by the question. “I’m going to ask you to leave,” the guard said repeatedly, physically backing Haraway up by getting in his face. “How far do I have to go?” Haraway asked. “I’m going to need you on the sidewalk,” the agent responded. “Hypocrite! Alyssa you’re a hypocrite! You have armed security here!” an observer yelled. Milano’s friends, meanwhile, had no problem denouncing guns while benefiting from her special protected status. PARKLAND SHOOTING USED BY MEDIA & DEMOCRATS TO PUSH FALSE NARRATIVE. As calm prevails over the Gun Control hysteria generated by the Parkland shooting, the truth begins to emerge. The young Nicholas Cruz was a disturbed child turned into a killer, created by the educational system and the politicians of Parkland, Florida. "The Broward school district’s repeated, emphatic — and it turns out, false — statements that Nikolas Cruz had not been in a controversial disciplinary program fit a pattern of an institution on the defensive and under siege. Facing significant legal and political exposure over the shooting at Marjory Stoneman Douglas High School, the district has tried to keep information from the public and put out untrue and misleading statements, frustrating parents who say this is the time for maximum transparency. The district is fighting in court against the release of school surveillance video. It flatly refused to issue any records regarding the shooting to the news media, in a possible violation of the state’s open-records law. Superintendent Robert Runcie has blocked critics, including parents, from his Twitter account. More than two months after the shooting, a Broward Sheriff’s detective told a state commission on school safety that he was still waiting for the district to provide all of Cruz’s disciplinary records. The worst came last week, when Runcie acknowledged that his forceful denials that Cruz had been involved in the Promise program, which is intended to provide an alternative to the arrest of students for minor offenses, were wrong. The district had repeatedly dismissed as “fake news” suggestions that Cruz was in the program. In an interview, Runcie said the district has held nothing back from authorities, providing records as soon as they could be gathered. Any delays reflect the state of the district's record-keeping systems, he said, not a reluctance to cooperate. He said he would look into the issue of the blanket refusals to provide documents to the news media. Although the Broward Sheriff’s Office has not produced every record requested by the news media, the agency has released dozens of documents, including reports of incidents at Cruz’s home and documents on its own flawed response. But the school district has issued a blanket refusal to release any documents, including emails about the shooting among the district’s leadership and formal notices of intent to sue by victims and their families, despite Florida’s broad public records law. The exemptions to the state open records law cited by the district concern claims or lawsuits involving the district and active criminal investigations. Barbara Petersen, a lawyer who is president of the First Amendment Foundation, which advocates the robust application of Florida’s open-records laws, said the district was misapplying both exemptions. The claims exemption must be construed narrowly to exclude only documents directly relevant to the claims. And the criminal investigation exemption applies only to law enforcement agencies and the documents they produce in the course of an investigation. “It does not apply to a school board,” she said. “What a lot of agencies will do is — say you’ll make the request for his disciplinary records — and the school board will say, we gave that to FDLE, it’s exempt under the active criminal investigation exemption. No, it’s not. The active criminal investigation exemption first applies only to law enforcement and second applies only to records created in the scope of that investigation. It does not apply to any record that (otherwise) More broadly, she said the Stoneman Douglas tragedy is a perfect example of a time when government agencies need to be as open as possible. The school district, joined by the Broward Sheriff’s Office, tried to stop the release to the media of surveillance video from the school. The district’s lawyers argued in court that the videos would threaten school security by revealing blind spots in the surveillance system. The district partially dropped its opposition after all sides agreed to an initial release of videos that showed the inaction of a Broward sheriff’s deputy who resigned after the incident. And the district lost in court when Broward Circuit Judge Jeffrey R. Levenson ordered the release of more videos, saying any “potential harm” to the school’s security system was “outweighed by the strong public interest in disclosure.” The school district, along with the state attorney’s office, is appealing. Runcie’s Twitter account contains fewer critics of the district, now that he’s blocked several of them. IGNORANT LIBERAL ENTERTAINERS HURT THEMSELVES WITH ANTI-GUN TIRADES. Texas-born host Kelly Clarkson railed the lack of action on gun violence in America after the latest school shooting. These foolish stars, who are always with armed security people, think American's care about there liberal-progressive views on guns. MORE GUN DEATHS AND SHOOTINGS IN CHICAGO. 2 dead and 18 wounded in Chicago shootings Friday and Saturday, 8/9 and 8/10, 2018. Chicago's gun laws are so tough that decent citizens cannot get guns. Criminals, of course, can always get guns. .